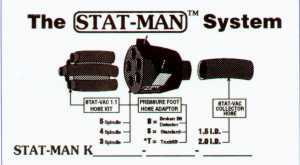 STAT-MAN VACUUM MANIFOLD KITS contain a STAT-MAN VACUUM MANIFOLD, a set of STAT-MAN VAC1.1 inlet hoses and ten feet of STAT-VAC collector hose. When ordering, specify the letter designation as indicated above, i.e., the part number for the STAT-MAN VACUUM MANIFOLD KIT for a 5 Spindle Excellon with a Broken Bit Detector and a 2.0 I.D. Collector would be STATMANK5B20. The K preceeding the spindle designates a complete kit.